Our electric bikes are suitable for touring or exploring with a range of up to 93 miles. German made for efficiency, we are the leading electric bike hire in Cornwall. We deliver to all sorts of groups including tours, schools, staff outings, hen & stag do's and family groups large or small. Bikes personally delivered to your accommodation or pre arranged location throughout Cornwall. Your peddles and bike fitted on delivery as well as advice on where to cycle and distances. If your touring, training, on holiday with family and friends or organising a large group, Go By Cycle have the bike hire, or electric bike hire in Cornwall, you require and will deliver to your accommodation, at a time to suit you. We are hire cycles to individuals, families and large groups. Our electric bike hire uses only top of the range German made e-bikes from Kalkhoff. Covering up to 93 power assisted miles a day. In Cornwall, with our incredible landscape, these can cover 50 miles plus depending on your route, making them perfect for touring or exploring. 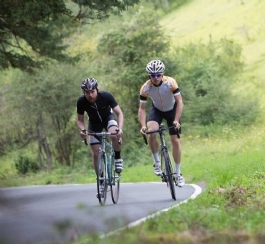 Our Road bike hire has only British made road bikes with steel or carbon options. Our Day bike hire and Touring bike hire are again, high spec with good gear ratios making cycling fun. All Go ByCycle's equipment is checked before delivery and supplied with helmets, pumps, locks and puncture repair kits, including spare inner tubes. We also offer Kayak hire and Stand Up Paddle Board (SUP) hire which is a great way to explore the exquisite coast line and estuary's for which our county is so well known. Hire cycles, SUPs and kayaks, delivered to your door and have all you need to enjoy your holiday in Cornwall from the moment you arrive. All our bike hire in Cornwall is delivered to you. SEE HERE FOR KELLYS MARATHON FUNDRAISING MISSION FOR DEMENTIA REVOLUTION! Pascale and Alain decided to see a bit of Cornwall whilst on Holiday from Canada visiting friends in London. They jumped on a train and we met them at Bodmin Parkway train station. 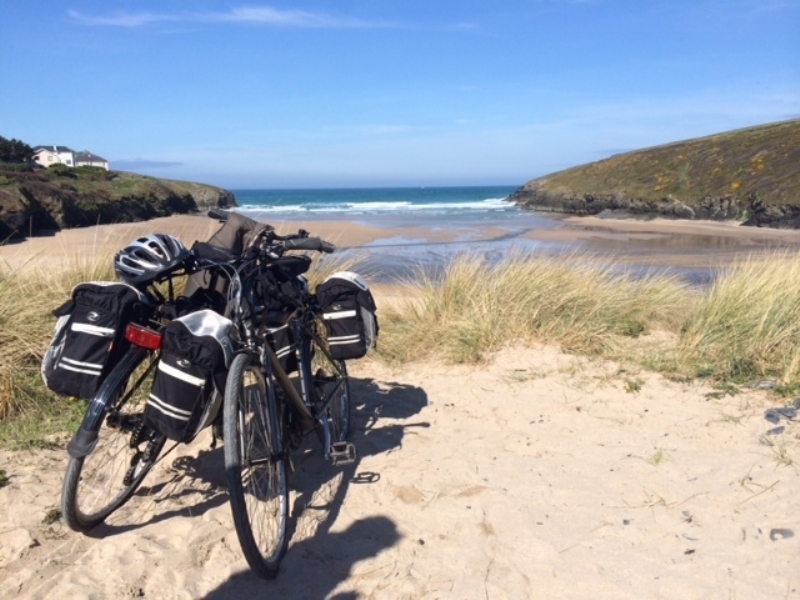 Experienced cyclists, we fitted their own pedals and paniers to the bikes and off they went for 5 days exploring Cornwall. Their first cycle was from Bodmin Parkway, along the cycle route - not the main road, joining up with the Camel Trail and spending the evening ( which turned out to be beautifully sunny and warm) in Padstow. They had a fantastic few days. An email recieved from them during the trip said 'We really have a good trip, we enjoy the hills!' We had warned them that Cornwall was slightly hilly and to relax and take their time - no setting big distances as their target each day - so they could make the most of Cornwall in the sun. 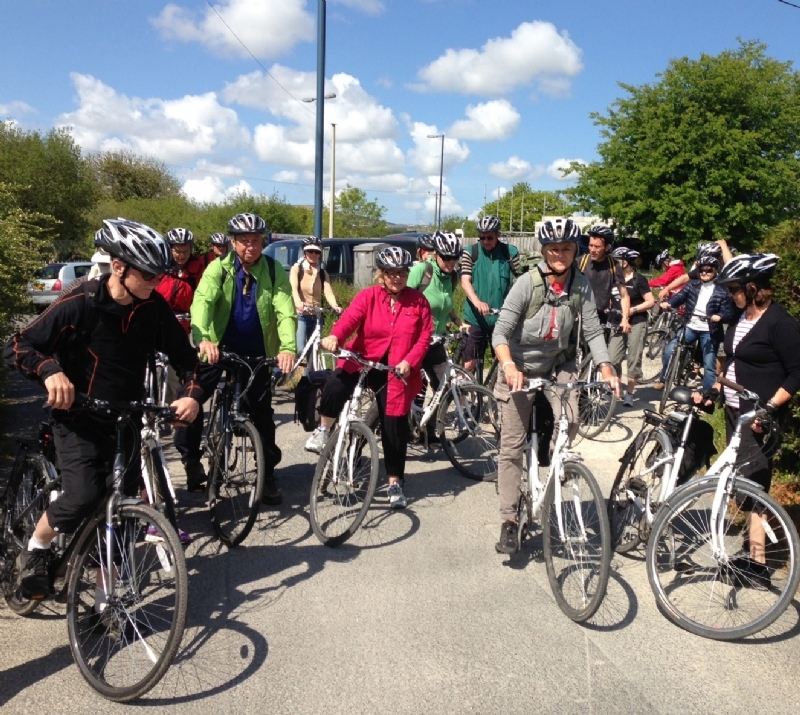 This is a large touring group for whom we have been providing cycles for many years now. They stay across Cornwall on a walking and cycling holiday exploring all the areas seen in program's such as Poldark and the Rosamunde Pilcher books and films. From Luxulyan train station the group cycle along the quiet country lanes to the Eden project (there is a discount to visitors who arrive at the Eden Project by cycle). They have the day at Eden and then return to the train station via a second more scenic route under a viaduct, where we collect the bikes. 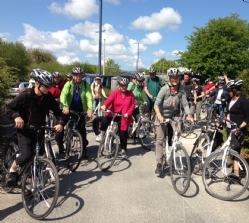 On the second day the group cycle 11 miles along the Camel Trail from Bodmin to Padstow. We collect the bikes in Padstow and the group go off to experience some of the best fish and chips in the country. Juliette, Louis and their delightful family come from a small french speaking Island with no hills and spent 10 days cycling Cornwall with their tents last summer. They had an amazing time, discovering places to camp along the way, although we did give them some advice on where to head for and called our friends at a local campsite for their first evening. They had a great spirit of adventure and Cornwall was just one of their stops during the family holiday of a lifetime. They used our lightweight day bikes and covered a lot of miles and saw some of our most spectacular scenery. They even sent Paul a bottle of Rum when they returned home a few months later to thanks us for the wonderful experience they had. We hope to see them again one day! This is one of our families that we see regularly with a variety of different family members and friends in tow. Our unique one way service means that we can meet people where ever they like along the Camel Trail and collect from any point on the same day. This time the group started from Crowdy reservoir right in the heart of Bodmin Moor. It's a spectacular cycle across the moors through St Breward and Blisland, both with lovely pubs, and down to the Camel Trail. The trail leads all the way to Padstow, which means you cycle over 24 miles in total. On this day we collected from a point on the upper end of the trail. At other times we have delivered to Blisland and the upper Camel Trail collecting from Padstow. I let you know by pleasure, that I was perfectly satisfied about all your services! It was all fine, I got a very well bike from Go ByCycle and the delivery and collection was just great! I really enjoyed my stay in Cornwall, beautiful area! Thank you a lot to make my holidays with your bike that lovely! Here is the only one picture I have with your bike from Sennen Cove. Rishmein cycled with his young teenage son and sent us this review of his trip. It's been a long time I was waiting for my son to be ready for this kind of vacation. My wife was in the Indian Ocean for 3 weeks and my daughter baby sitting in Sicily. The timing was perfect to decide for a tour on a bike with my son . It's been 2.5 years we are in London and eager to discover other parts of UK before going back to France. Cornwall looked to be an obvious destination . We started from Bodmin using the Camel back trail to Padstow, then St Agnes, St Ives, Lands End and Penzance, all in 5 days. We took our time and time to talk to people at all the places we visited. The weather was perfect as we did not experience a drop of rain . Paul was great and very professional as he brought us our bikes to our hotel and collected them back at our destination. The bikes were great and in very good condition. Rishmein kindly sent us photographs of his trip which are dotted throughout the website, as did Pascale and Alain and many other cyclists. Please keep them coming!